Everyone loves free Wi-Fi, before you connect to an open wireless network, though, you should take necessary steps to protect your personal information. Everyone loves free Wi-Fi, before you connect to an open wireless network, though, you should take necessary steps to protect your personal information. I remember traveling to New York for the first time, the hotel I stayed at had a poor Wi-Fi connection. Fortunately, there were free wireless networks available. Little did I know I could have compromised my personal information connecting to these networks. If you plan to connect to a public hotspot, here are some things you can do to stay safe. Let’s start with something everyone should use. If you want the best security while using a public hotspot, use a Virtual Private Network (VPN). A VPN provides a secure connection to the public Internet, protecting your privacy by hiding your IP address and communications. Typically used by business users, setting it up might sound like a daunting endeavor, but there are third-party VPN services that are easy to use. We recommend the paid VPN Service from Private Internet Access that’s available for $3.33 per month. Private Internet Access also offers apps for your iPhone or Android phone, too. If you are on a budget or don’t use public Wi-Fi very often, you might want to try out Hotspot Shield’s free VPN. Only use this in a pinch though since its ad-based, and don’t expect great performance either, it’s rather slow unless you pay for the ad-free premium version. If you are connecting to an unsecured wireless network, there are other things you can do to protect your personal information. 1. Avoid online banking and other transactions that might require credit card information. Sometimes you might want to manage your finances while on the road, but this can be a sure way to compromise your personal information. Malware such as key loggers can use such events as an opportunity to sneak into your computer then harvest your account and passwords. 2. Use a guest account when connecting to public networks. 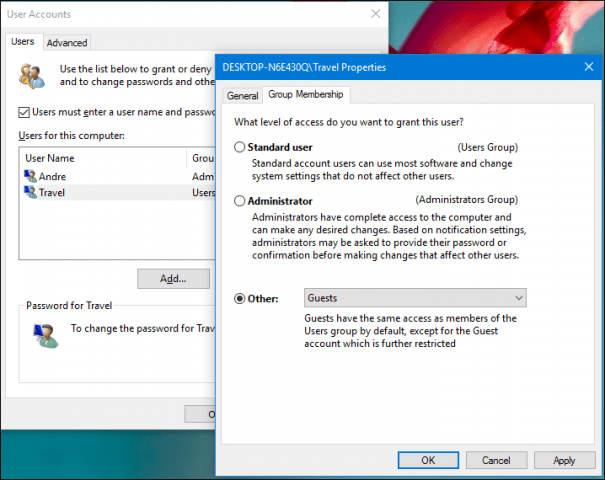 Windows 8 and older versions of Windows include a Guest account you can enable easily from with the User Accounts located in Control Panel. Click Add then click Sign in without a Microsoft Account then click Local. Create a username and password then select the account then click Properties then click the Group Membership tab. Select the Other list box then click Guest then click Apply then OK.
3. Enable two-factor authentication. This provides an extra layer of security, not only on Wi-Fi but anywhere you’re using the web. For instructions on setting it up, read: Two-Factor Authentication Guide for Securing Your Online Life. 4. 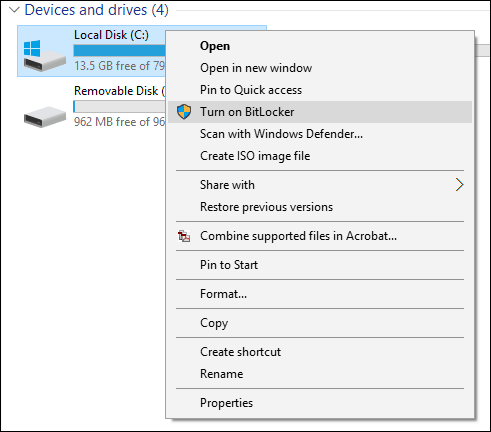 Enable BitLocker Drive Encryption if your version of Windows supports it. Utilizing Encryption helps to keep your files and communications secure. 5. Make sure your operating system and other security utilities such as Antivirus and AntiSpyware are always up-to-date. 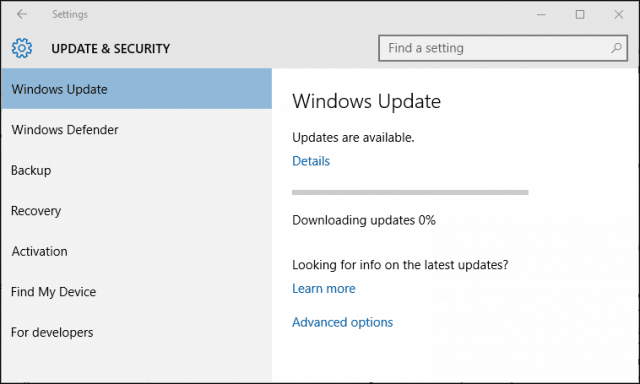 In Windows 10 head to Start > Settings > Update & Security > Windows Update > Check for updates. 6. 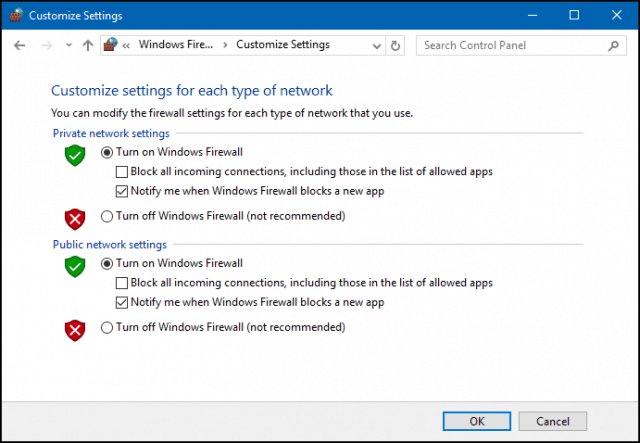 The Firewall, in modern versions of Windows, is enabled by default. Sometimes the Firewall might be turned off that removes a critical layer of protection. To ensure your Windows Firewall is working, click Start, and then type: windows firewall then hit Enter on your keyboard. Click Turn Windows Firewall on or off. There are ways hackers can spoof legitimate and highly trafficked websites. When you think you are purchasing an item from amazon.com, it is actually a fake site made to look like amazon.com. If you need to do email, setup an alias account separate from your main email. When you are done using the account, you can throw it away or keep it just for such activities. The methods for setting up alias accounts might vary across services. For Gmail, click here, for Yahoo! go here, for Outlook.com click here and iCloud here. You should also read our article on how to set up an alias account in Outlook.com. 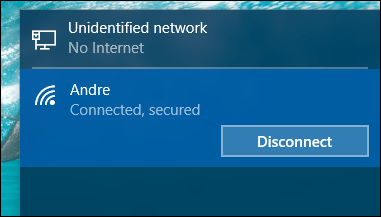 Watch out for that free token Wi-Fi network, it might be a trap. If the majority of networks in your vicinity are secured but one network happens to be the only one open and free, it’s probably a honeypot waiting to steal your information. Avoid it. Turn off wireless when you are not using it. This can be a big mistake when connecting to public wireless networks since you can leave your computer open to an eventual attack. Turning off wireless when you are no longer browsing, keeps the device safe by not providing an easy means of getting in eventually, since persons trying to infiltrate your device are persistent. Make sure the websites you visit have appropriate security protocols. Look for Secure Hypertext Transfer Protocol or HTTPS in the browser’s address bar. In fact, an essential browser extension we recommend is HTTPS Everywhere. This extension ensures you have a secure connection when visiting common sites like Google, ebay, Amazon and others. It’s available for both Chrome and Firefox on Windows, Mac, Linux, and Android. It’s developed by the Electronic Frontier Foundation (EFF) and you can download it here. For other quality extensions to use to keep Google Chrome safe, read: Chrome Extensions to Keep Your Browsing Safe. While the above tips will help with security, it bears repeating that you shouldn’t do any banking or purchasing items while connected to a public Wi-Fi hotspot. These days, it is much harder to find free public wireless networks since users are now securing them preventing strangers from using up their bandwidth. Some cities are beginning to offer free public Wi-Fi, but they might be bogged down if many users are connected. One option you can look into is Microsoft’s new Wi-Fi service. It lets you connect to approved and secure wireless networks at hotels, airports and conference centers. The service requires purchases but is guaranteed to be trusted. You can’t beat that in times like these.